Legends Isabell Werth and Ijsbrand Chardon were victorious in an exciting day of World Cup action in Stuttgart. Werth steered Bella Rose to victory in the third leg of the FEI Dressage World Cup™ 2018/2019 Western European League at the German Masters. It was a clean sweep on the podium for the home country with Dorothee Schneider in second on Sammy Davis Jr and Helen Langehanenberg in third with Damsey. In the FEI Driving World Cup™, Dutch master Chardon beat out two other teams in an exciting drive off, finishing in 146.95 seconds with four penalty points, for a total score of 150.95. Second place went to Belgium’s Glenn Geerts, who had the only double clear of the day for a drive-off time of 154.73. József Dobrovitz of Hungary finished third in Saturday’s Driving event on a total score of 158.96, including 8 penalty points for knock downs. Werth described the win as "special" for herself and Bella Rose, coming two months after they scooped double-gold at the FEI World Equestrian Games™ 2018 in Tryon. "This was her last show before her injury four years ago, so to come back today and to win like this is something special!" she said. 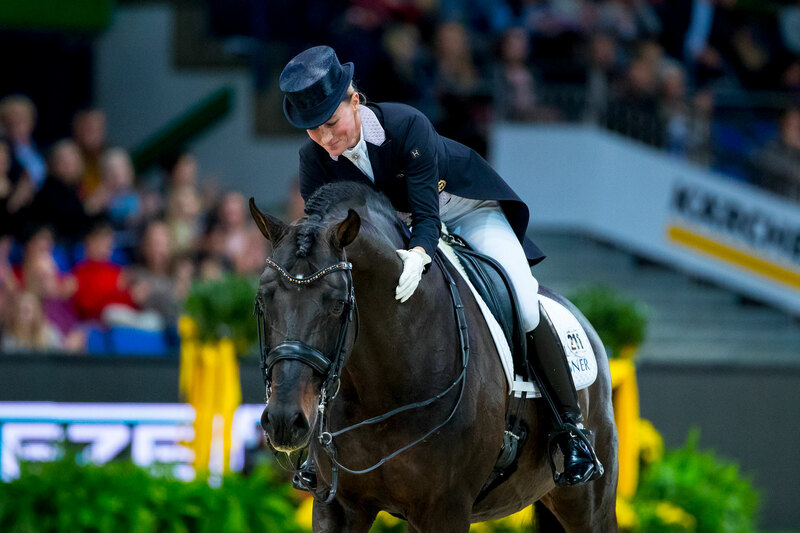 From the outset there was a big buzz in the Schleyer Halle, with The Netherlands’ Emmelie Scholtens and Desperado, who finished last of the 14 starters in Friday’s Grand Prix, bouncing back to set the standard with a nice pathfinding test at 75.365. With extraordinary accuracy and control, Langehanenberg went into the lead when posting 81.470 when fourth-last to go, and she was still out in front when Denmark’s Daniel Bachmann Andersen put 81.190 on the board. It was his horse Blue Hors Zepter’s first ever Freestyle test! But it was compatriot Dorothee Schneider’s 81.840 that Werth was chasing when last into the arena. And she nailed it by a considerable margin, posting 85.660 despite one major blip. But as the athlete who has collected eight World Championship and six Olympic gold medals pointed out, “she was brilliant again for the rest of the test. The piaffe/passage couldn’t have been better and her half-pass extensions were super!” she said, and that was borne out by the number of maximum scores she earned from the judges which put the result beyond doubt. It was a tricky course set by Dr. Wolfgang Asendorf, who also designed the Driving obstacles at the recent FEI World Equestrian Games™ at Tryon. Six Driving teams participated in the event over two days, with no points carried over from the first day and no points carried into the final drive off. The speedbox element has been enlarged since last season’s World Cup competition, allowing for greater velocity but still requiring tight precision to avoid hitting a cone and accruing penalty points. Saturday’s Stuttgart course also included a water element, which made the driving carriages and footing more slippery at its exit, demanding top four-in-hand skill from the drivers and testing each team’s navigator and backstepper. After the first round of driving, Glenn Geerts had barely exited the ring before he was back for the drive off. He put in a super fast time with no penalties and had to wait to see if it would hold for the gold medal position. After József Dobrovitz had two cones down to add to his score, Geerts was guaranteed at least a top-two finish, but Ijsbrand Chardon put his years of driving expertise on display for a blistering time that made his 4 penalty points irrelevant. In the end, behind Chardon, Geerts, and Dobrovitz in the 1-2-3 podium spots, Chester Weber of the USA finished fourth. They were followed by defending World Cup Driving champion Boyd Exell of Australia in fifth, and Germany’s Georg Von Stein in sixth. Chardon’s win this weekend boosted him to the top of the qualifying standings on 13 points, ahead of Jérôme Voutaz of Switzerland on 10 points and Glenn Geerts now on 7 points.